It was 50 years ago today (on 1 June 2017). A celebration that could not be missed. In fact I just learned that in my country the album was not available for a week as the sleeves did not get here in time due to strikes at the airport. One is never too old to learn. So our party is still five days off, but celebrated anyway. At the time of writing this, it's the day after, 2 June. The day the world woke up 50 years ago and understood that musically it would never be the same again. It is strange to read about the impact 'Sgt. Pepper's' had without ever being able to understand that personally. 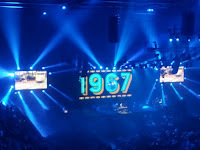 The Analogues took a gamble, won and nearly filled the Ziggo Dome, the largest arena sized venue in this country. At the moment the show should have started I was seriously worried. Is this ever going to fill up even half? It did and the show started late. It filled with people of all ages, some so feeble that they had trouble to reach their seats. Children, teenagers, youths, middle aged, elderly, three generations together, all were there to be a part of a special rendition of the best music ever made. The bar went up extremely high on that day 50 years ago. Of course there have been made many fine albums since, but this is where it all started and I could be a part of its celebration. 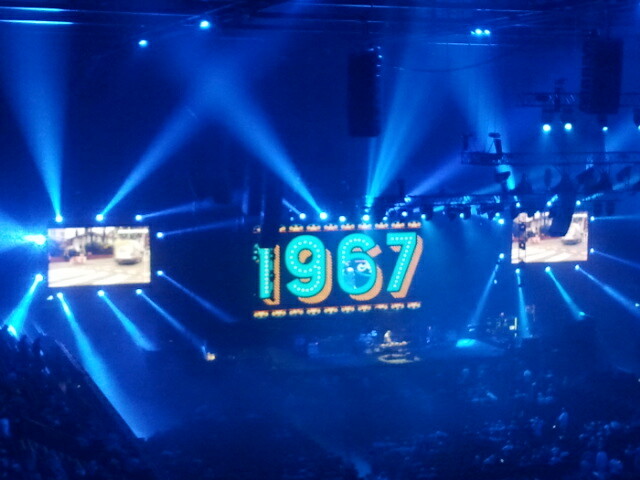 We were treated first to a dj set with 1967 as a theme, obviously. My 16 year old step son who went with me as a birthday gift, asked me "do you know all these songs?". The answer was, yes, until the very, very end. An Aretha like song, I'd never heard before. Before I could whip out the old Shazam, he turned it off for another song. A mistake? One song was not from 1967, but recorded late in 1968. I wonder whether anyone else noticed? It was one of the most potent ones the man played and of Dutch origin. The whole world plays 'Venus' to this day, 'Send Me A Postcard' is the so much better song. One band was missing the whole time I listened, but was played at the very end, 'Let's Spend The Night Together'. On the screens on the side, a livecam at the famous crossing at Abbey Road showed us what people do there whole day: Risking their lives in busy traffic posing as The Beatles. 48 Years after 'Abbey Road' youths from around the world are attracted to that crossing, although it is no longer in the same position. Which is pretty amazing come to think of it. They all weren't alive when the album was released, not by decades even. The Analogues entered the stage and treated us to two albums from 1967. 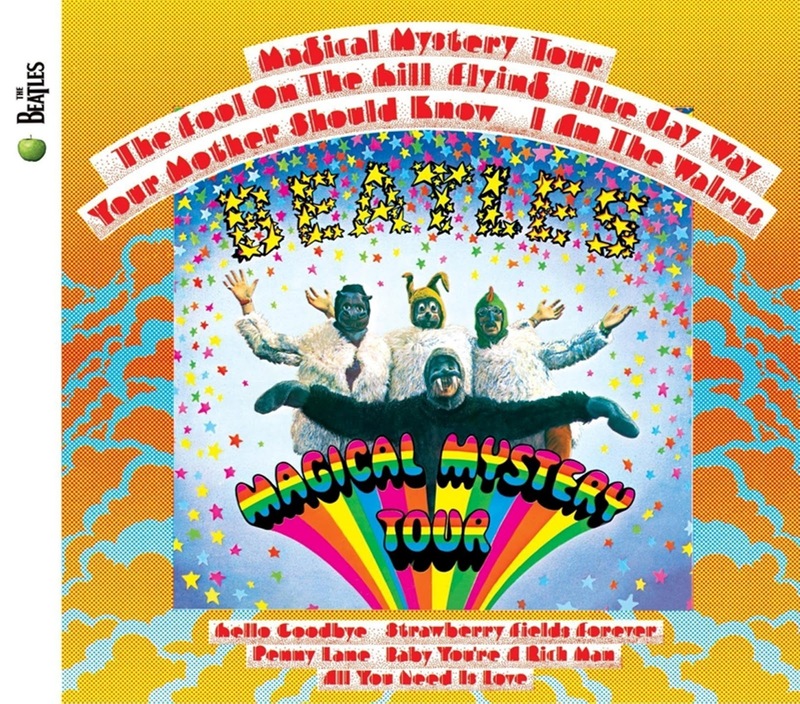 First 'Magical Mystery Tour', the U.S. released album with all the singles from 1967 and a few outtakes, also available on the double EP. Just the singles from 1967 show how good The Beatles were in that year. 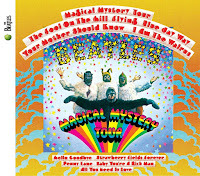 Just let this sink in: 'Penny Lane'/Strawberry Fields Forever'; 'All You Need Is Love', Magical Mystery Tour', 'Hello Goodbye'/'I Am The Walrus'. Only 'Magical Mystery Tour' did not reach #1 in NL something incomprehensible as it is so good. So there's also 'Flying' and 'Blue Jay Way', but why not. Then 'Sgt. Pepper's' after a short break in which Geoff Emerson told us on film about recording with The Beatles at Abbey Road. A young staffer at the studio who became a part of history because he dared to push boundaries in his work space. Assisted the best band to get the best and cutting edge sound that allowed them to push their boundaries beyond what people had heard before. After the brake the band returned with several guest of which some added to the whole and others were like a fish out of water. Not all voices fit the songs of The Beatles. Like the musicologist at the start said on film: "Don't play The Beatles, unless you are very good", sanctioning The Analogues of course. Dave von Raven was totally in his element with the two very oldies he could play. With eyes closed it was possible to imagine a young Lennon on stage. Douwe Bob, who's father Simon was involved with the artwork of Sgt. Pepper's, did a fine 'Get Back' at the edge of his vocal range. Berget Lewis did a fantastic rendition of 'Oh Darling'. Her voice better suited than McCartney's even. The song got a soul injection taking it through the roof. Release it as a single, I'd say. It was Barry Hay who was totally outside of his element. His voice doesn't belong in a The Beatles show. Strangely enough the result was that I was singing 'Going To The Run' to myself on the way home. That has everything to do with me practising the song for the band I'm in, I guess. The double solo at the end of 'While My Guitar Gently Weeps' I could have done without also. 'The Ballad Of John & Yoko' with Felix Maginn was powerful. 'Girl' with Henk Hofstede what it ought to be. It all ended with the 'Abbey Road' medley in its full glory, with the whole orchestra present: "And in the end, the love you take, is equal to the love you make". One of the best pieces of music ever made. The Analogues returned for one song, just the five of them and played 'Revolution', rocking ever so fine, and we were send home. All celebrations, which included the presence of Geoff Emerick, over, the throng went home filled to the brim with the music of a band that has been around for 8 years and no longer for 47 years. A band that changed music, culture and bridged gaps between generations. The band that surfed the highest wave of the 60s. "Our classical music", as Bart van Poppel of The Analogues says at shows. It is. In 2018 The Analogues return with 'The Beatles'. In the meantime I would not be surprised if they conquered the world. What they do is unique and of the highest standard. In 2017 there is no better band.